In clear contrast to my cakey colleague – and there I’m going to hit the alliteration on the head no sooner than it’s begun – Fitzbillies and I are no strangers. I wouldn’t go so far as to say I’m an old hand, but I’ve been around the block once or twice, where ‘around the block’ should be understood as ‘in there for cake’. I have a particularly fond memory of combining some fruit-filled pastry things with Belgian Abbey beer, the whole serving as a most nutritious lunch. This was the first time, however, that I’d sat down in FB’s café section. Having obeyed the injunction to wait to be seated despite the fact that the place was mostly empty, the two of us were directed to a table for six. Here we were able to enjoy the aggrieved stares of other customers in spacious comfort, secure in the knowledge that they thought we had seated ourselves and made up in illiteracy for what we lacked in breeding. Unbowed, I ordered some spiced farmhouse tea loaf and a double venti mochaccino. No, ladies and gentlemen, the truth must out. You have done nothing to deserve my gentle humour. Tea loaf and tea it was. The tea was fine, being simply two teabags and some boiling water. The tea loaf was equally fine, and the complaints that follow would probably be churlish regarding somewhere less obviously part of the local landscape and impressed with that fact. Yet that loaf could and should have been more. 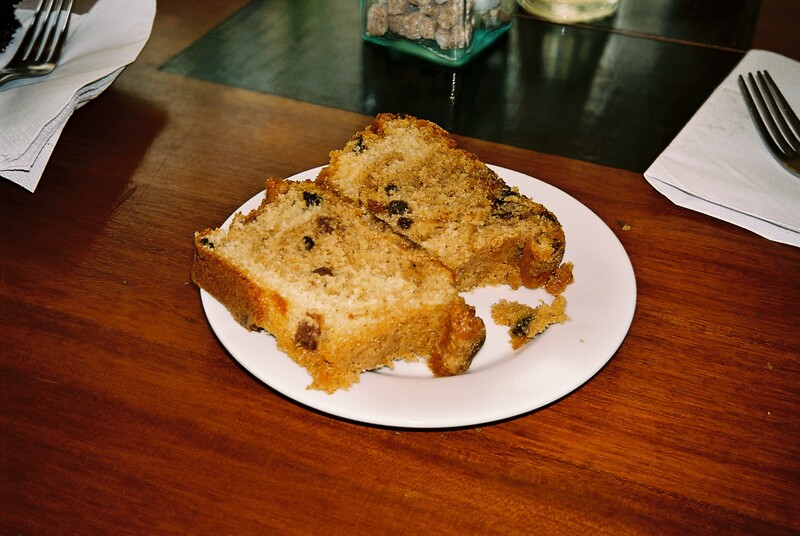 Tea loaf, as you know, consists essentially of three elements, namely cake, raisins and crunchy brown sugar bits. Though separate in their uneaten state they should fuse in one’s mouth into a loafy amalgam, each element contributing to a greater whole. But for this to work the elements need already to be teetering on the brink of combination; to require just that extra masticatory shove to make the leap into caketastic yummitude. But alack! in FB’s this was not to be. The crunchy brown sugar bits were too clumpy, not dissolving in the mouth but remaining as sudden, stubborn polyhedra of sweetness. The raisins were more welcome, though these moist oases only served to highlight the distinctly drought-affected nature of the loaf itself. Cambridge is built on a drained fen, and clearly that is in no danger of reasserting itself with the good people of Fitzbillies in the way to beat back the water, palette knives a-slashing. Still, we sat at their six-man table for about an hour and half, and that probably pissed them off a bit. Polly Tearooms were sold to me as the crème de la crème. Country Life recently had them down as the finest teashop in England, a claim unhesitatingly echoed in the Daily Telegraph. Very possibly this is true, but it does mean that the best teashop in England does not sell Victoria sponge on a fine afternoon in May. But there they sat regardless, with the local Tory party headquarters plumb spang across the High Street and grey-haired old biddies and equally grey-haired American tourists filling up their tables. The Tearoom’s website invites customers to send in poems about their experiences of Polly’s. Euterpe allowed me ‘Tiffin’s made of biscuit bits: is it really cake?/I wanted some Victoria sponge, for God almighty’s sake’ before she drifted off, possibly to the nearest M&S. But in her absence I can tell you that Polly’s tiffin is really rather good. 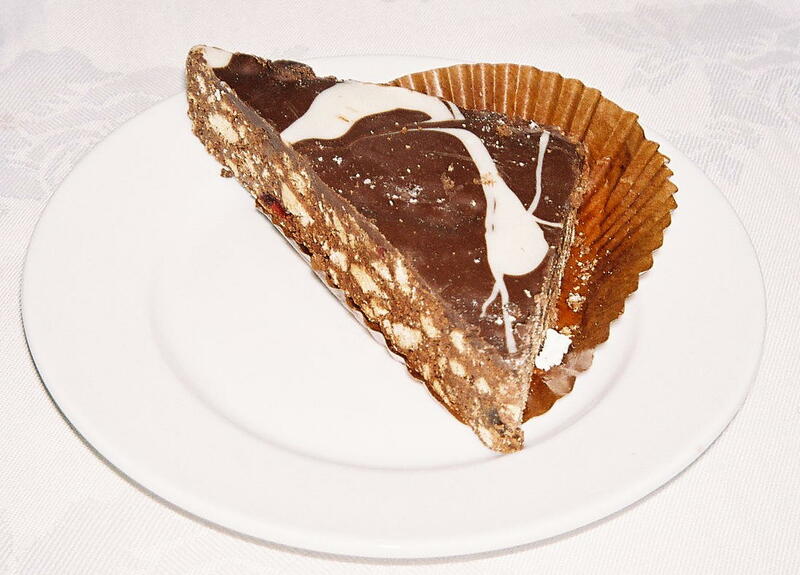 It’s sort of like reverse cheesecake, with the thick chocolate topping as the biscuit base and the biscuitish-toffeeish-cherryish mass as the cheese. It comes in a hearty slab, is full of nicely contrasting textures and goes very well with Darjeeling. It even has an etymologically obscure and vaguely lost-empire name, which is just what you want in a place with sagging wooden beams and sun and Tories and teapots. But before I break into a one-man chorus of ‘Jerusalem’ I’m going to calm down and leave you, with the information that a poster in the gents declares the state fish of California to be the garibaldi and who knew? During my year in Cambridge, Fitzbillies took on a somewhat mythical status for me. It was only a minutes walk from my college, possibly the nearest cake seller in a town seemingly made up of cake sellers, yet I never went there. Part of the reason may have been the outrageous amount of cake freely available to post-graduate students and part of it may have been due to the very little money that I had. But mostly it was because Fitzbillies looked so good. Seemingly endless varieties of delicious cake could be glimpsed through the window. I didn’t want to go in and ruin the illusion. However, last week I became brave. I declared that in celebration of the imminent employment of our Victoria Sponge Correspondent, we should visit Fitzbillies and partake of the cake in all its glory. In hindsight, this has struck me to be rather a foolhardy choice. Some dreams are best left untouched. Our mistake first emerged as we walked through the door. A very large sign blocked our path: “Wait here to be seated”. This is not uncommon. However, it is uncommon for there to be no sign of service for the next five minutes, especially in a tea shop where business could best be described as ‘languid’. There were a lot of empty seats around. Victoria Sponge and I debated whether we should perhaps seat ourselves. We are both, though, very English and not very good at disobeying signs. We therefore waited, were eventually greeted with what seemed like mild displeasure and put in our place, both literally and metaphorically. My choice was the ordinary Chocolate Cake. Here, apparently, was my second mistake. Connoisseurs of Fitzbillies favour the French Fancies or Chelsea Buns. Unfortunately, my taste buds led me rather astray. In appearance the cake was everything that a large slice of chocolate cake should be – two slabs of sponge, held together with gooey icing. There was nothing particularly sophisticated in its appearance but when something tastes good, sophistication is not required. Instead, the sponge was dry and the icing not as sweet or fudgy as it should be. 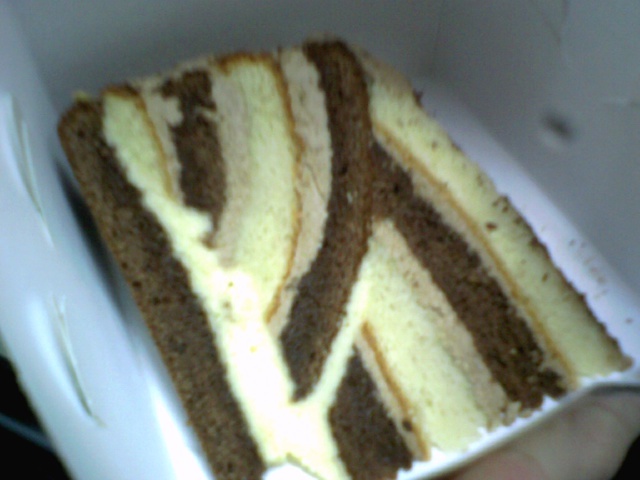 It was not that the cake was outrageously bad, more that I had expected so much more. And later experiences demonstrated just what that something more could be. Following my trip to Fitzbillies I stopped by a birthday party for an old friend. Much cake had been provided for this auspicious occasion. There was some beautifully moist and squidgy apple cake and an overwhelming pecan pie but the star attraction was definitely the triple layer chocolate truffle cake, baked for him by a fellow student. Each layer of sponge was the perfect texture and balanced by the rich icing that managed not to overwhelm the whole. It looked spectacular. It tasted spectacular. It made me weep to think that this was everything that Fitzbillies could and should have been. The Chocolate and Vanilla Puzzle Cake serves up something of a conundrum to enthusiastic cake eaters. Do I eat, or do I simply sit and admire the precision intersections of sponge and icing? Well, hopefully, after a suitable period of admiration they will tuck in as this is a cake that definitely deserves to be devoured. The texture is perfect – the sponge is light and moist, while the icing is not overwhelming. The chocolate sponge is perhaps not as chocolately as one would hope, and the icing suffers a similar fate. I suspect that the flavour of the icing has been sacrificed to the demands of the cake’s appearance – a choice that I can certainly understand, even while craving for more cocoa. Amongst the many treats that the Borough Market has to offer, the puzzle cake is certainly an eye-catching choice and probably the option that confounds many a person in the puzzle of a dieting dilemna. Are you a caterpillar lover or a chocolate lover? 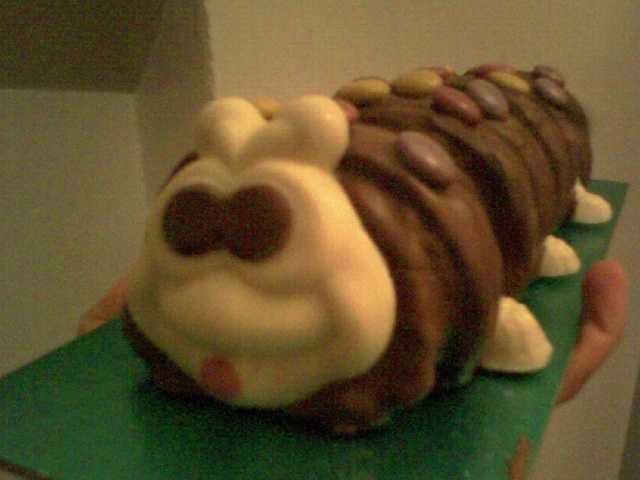 In either case, Colin the Caterpillar could be the perfect cake for you. 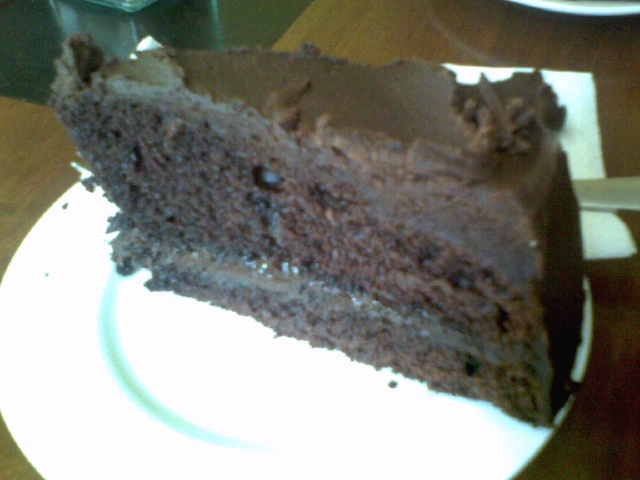 The sponge is cheap and cheerful but this does not matter because the rest of the cake is brutally chocolatey. It is a chocoholics dream, from the chocolate cream that holds it together to the chocolate covering that gives the caterpillar its shell. The feet are made of chocolate, the tail is made of chocolate, the face is made of chocolate. 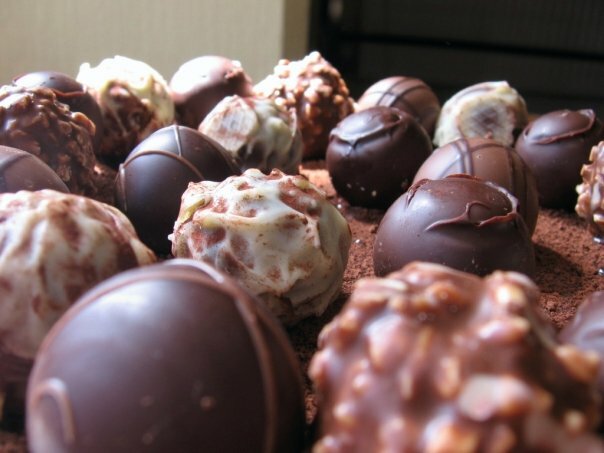 There is no way that chocolate can be escaped in this confection. Colin also looks perfect – he entertains the birthday child whatever the age – but if you are looking for anything more than chocolate, chocolate and chocolate in your birthday cake, or indeed a cute caterpillar face, then it might be better to look elsewhere. Though why that combination could fail to keep you happy I am at a loss to understand. Colin, as far as I am concerned, is liable to turn us all into very hungry caterpillars indeed.